Jason Morgan is a local painter who is know for his portraits and hyper realistic still life paintings. His work has been showing at the Art Museum in Springfield, OH since mid summer and I saw him soon after the exhibition opened (You can see his work in the background of the photo). Over the weekend, I had some spare time and decided to take an hour and see if there was anything new at the museum. I was surprised to see Jason painting in the middle of the exhibit while answering questions from the gallery visitors. I’d say that was pretty good planning (pure luck) on my part. 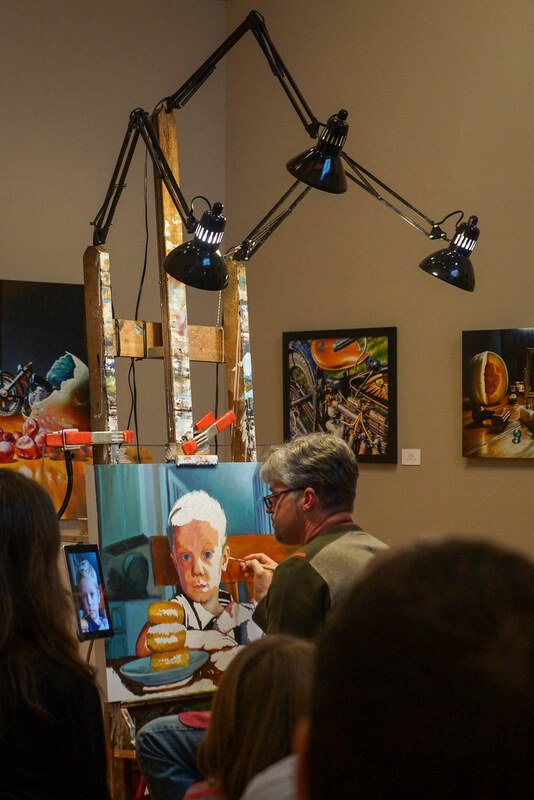 As a non-painter, I was really interested to hear about the process of painting as well as what inspires him.the entire experience left me better educated as well as in a position to better understand his work. My hat is off to the folks on the museum staff that arranged for Jason to paint live and answer questions. If you are in the central Ohio area, give the museum a visit. I think you’ll agree it’s time well spent. You can find out more about the museum here.